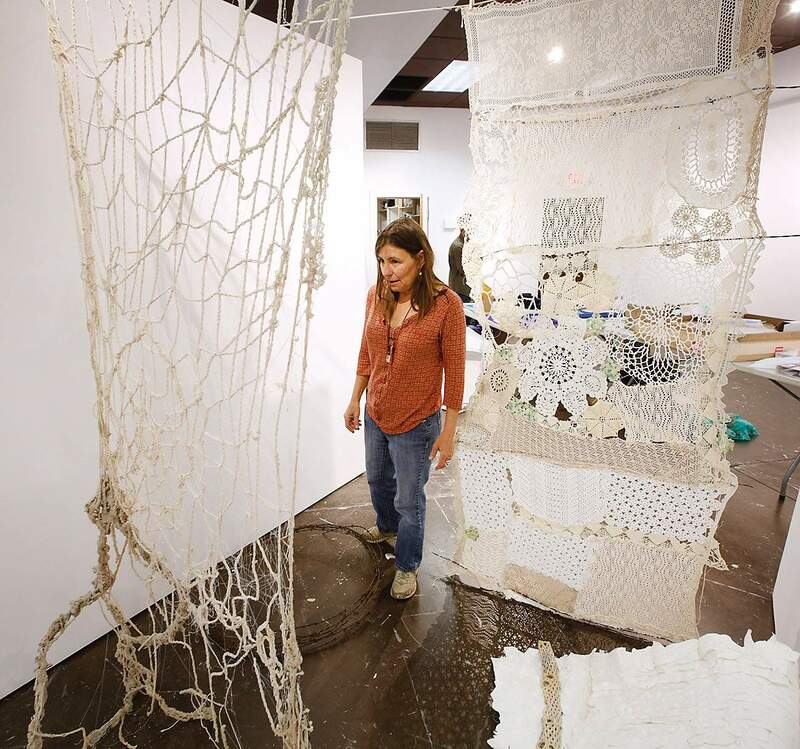 Sandra Butler, education director at Durango Arts Center, sets up her contributions to “The Wall,” a new show opening Friday in the Barbara Conrad Gallery at DAC. There are walls all around us: from walls that hold up buildings, to walls to keep people out (or in), to the walls we put up in our minds. It’s the idea of walls that is the subject of the new show opening Friday at Durango Arts Center. Curated by local resident and artist Michele Sensing, “The Wall” explores every aspect of barriers – from the literal to the complicated psychological. It features artists Ryan Aragon, Sam Bridgham, Sandra Butler, James Earp, Veryl Goodnight, Ross Rudel and Sensing. The monthlong exhibit will also include artist talks, lectures, film, an artist reception and performances by 20MOONS Dance Theatre. Sensing’s piece is specifically about the Arizona-Mexico international border. Originally from Phoenix and having grown up going back and forth across the U.S.-Mexico border, she said for her, it’s personal. Sensing camped along the border for a couple of weeks in the Buenos Aires National Wildlife Refuge in Sasabe, Arizona, taking photographs for her piece. Contributing to the show is Butler, DAC’s education director. At first glance, her three pieces look dainty: Crocheted doilies and bits and pieces of vintage needlework are combined with hand-stitched paper. It’s not until you get up close that you see the pieces are offset by brutal-looking barbed wire. The work represents the complicated relationships in families, she said. Peter Hay, exhibits director, said the “The Wall” is a year in the making. He put out a call for open proposals, where artists can come up with their own ideas and Sensing’s was the one selected. “Having a community arts center means taking input from the community,” he said, adding that the show has really taken shape in the last six months. The exhibit will be up through May 26. A series of events will be held throughout the month as part of the show, including speakers, a film festival, an artist reception and a dance performance by 20MOONS Dance Theatre. What: “The Wall.” Featuring the work of Ryan Aragon, Sam Bridgham, Sandra Butler, Jim Earp, Veryl Goodnight, Ross Rudel and Michele Sensing. 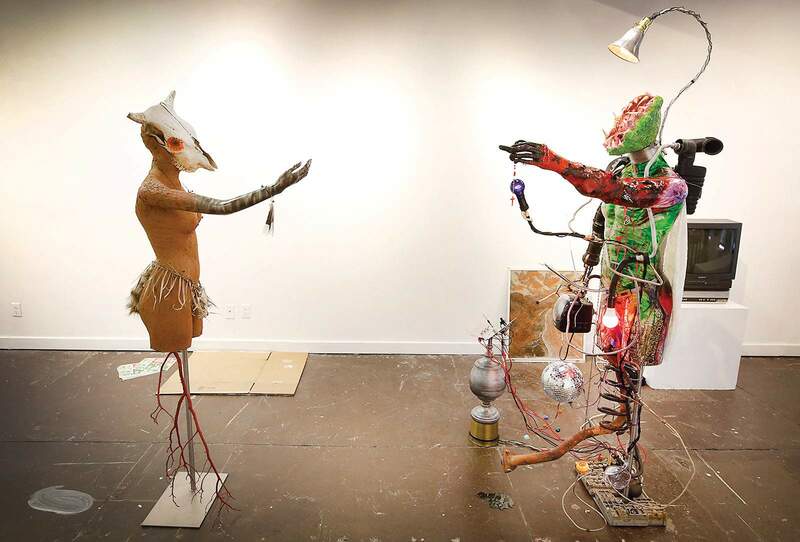 When: Opening presentation, 5 p.m. Friday with “A line in the Sand,” Cody Ferguson, U.S.-Mexico Border historian and Artist Talk with Ross Rudel, internationally renowned sculptor. Film festival, May 1, MUMVI – International Multidisciplinary Dance Film Festival. Organized by Sur Oeste Arte Escenico of Mexico City. Artist reception, 5 p.m. May 4. Walls as Eco Barriers, Dr. Andrew Gulliford, 6 p.m. May 4. Dance performances by 20MOONS Dance Theatre: 5 p.m. May 11, 12, 18; 6:30 p.m. May 19; 7:30 p.m. May 17; and 2 p.m. May 20. Tickets available at https://bit.ly/2HaBTgx. More information: Visit www.durangoarts.org or call 259-2606.